but sometimes we have to do things we do not want to do because those are the things that make us think. 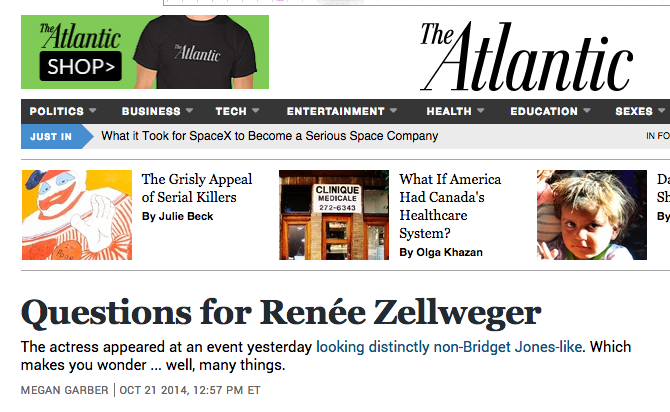 renée zellweger is trending today because she went to an event last night. this makes me wonder about many things. first, renée zellweger’s face appears to be the new ebola. as in, all of the hysteria and panic and WHATISHAPPENINGWITHTHEWORLD ITISFALLINGAPARTAROUNDUS feelings around ebola seem to have- WITHIN HOURS- siphoned off onto the issue of renée zellweger’s face (which has, in fact, looked this way for about the last year). 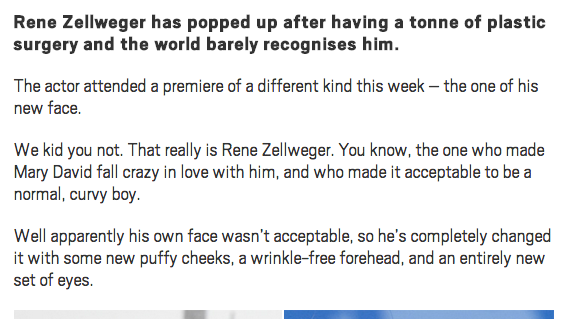 second, the story of renée zellweger’s face is, in huge part, a story of people’s response to the story of renée zellweger’s face. which is all a bit wag the dog. the thing is, maybe she had some work done, maybe she didn’t. maybe she lost weight. maybe she had surgery on her eyes for medical reasons to improve her vision. maybe she’s happy, maybe she’s not. maybe her boyfriend grew that afro, and she thought, oh, i’d like to change it up as well. i don’t know. i don’t know renée zellweger. i don’t know what the story is with her face. what i do know is that the whole internet did not freak out when brad pitt appeared to have gotten fillers in spring/summer 2013. or the same for tom cruise in spring 2014.
with the exception of bruce jenner, we do not do this with men. we do not treat men this way. we do not look at a man’s face and go, OHMYGOD what has he done?!?! he’s a whole new person. how distressing!! so riddle me this: if renée zellweger’s face is upsetting- and the headlines are screaming at us that it is- then why is it upsetting? 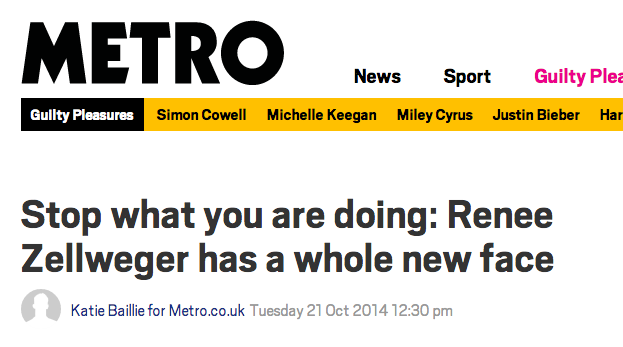 presumably it is upsetting because renée zellweger is awesome and we (you, me, the press, the internet, etc.) all love her. but isn’t it also upsetting because renée zellweger is a woman, and women in hollywood are held to a different standard and, in the effort to live up to that standard, women in hollywood often mess with their faces and we- you and me, as people who believe women should not be held to any different standard than men- are upset that renée zellweger’s face appears to have been modified to fall in line with that standard? we read renée zellweger’s face as renée zellweger having given in. aren’t we still treating renée zellweger differently than we do brad pitt or tom cruise or george clooney? in looking at her face, worrying about her face, tweeting about her face and telling others to look at her face too, aren’t we still holding renée zellweger to a different standard than we hold all of the men in hollywood (with the exception of bruce jenner)? i think we are. and, to be honest, i find that a far more upsetting revelation. This entry was posted in "women", AGING IS OK, renée zellweger. Bookmark the permalink.